We use quantitative experimental techniques to study how the cooperative behaviors of molecules give rise to the architecture and dynamics of self-organizing sub-cellular structures. 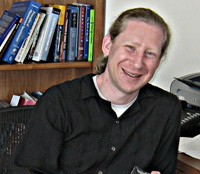 Dr.Daniel Needleman These collective effects are not only directly relevant to cellular organization, they also raise a number of fascinating questions concerning the mechanics and statistical physics of these highly nonequilibrium systems. Our long-term goal is to use the knowledge of sub-cellular structures to quantitatively predict biological behaviors and to determine if there are general principles that govern these nonequilibrium steady-state systems. The lab currently focuses on studying the spindle, which segregates chromosomes during cell division. 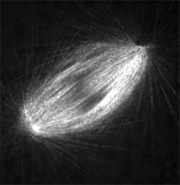 The spindle is a dynamic steady-state structure composed of a plethora of molecules, most notably DNA, which is compacted into chromosomes, and the protein tubulin, which forms long fibers, called microtubules, which are oriented into a bipolar array that constitutes the bulk of the spindle. Even though the overall structure of the spindle can remain unchanged for hours, the molecules that make up the spindle undergo rapid turnover with a half-life of tens of seconds or less, and if the spindle is damaged, or even totally destroyed, it can repair itself. While many of the individual components of the spindle have been studied in detail, it is still unclear how these molecular constituents self-organize into this structure and how this leads to the internal balance of forces that are harnessed to divide the chromosomes. We are trying to figure out how microtubules really behave in spindles, how these behaviors give rise to spindle structure and dynamics, and how the spindle changes over the course of evolution. Quantitative characterization of a fluorescently labeled fusion protein in a living human tissue culture cell measured by multi-point fluorescent fluctuation spectroscopy with a stationary CSU. (A) An image of the cell edge. (B) The displayed map shows the locations of the pinholes from the stationary spinning disk - with their color indicating the measured number of molecules at that location. (C) The measured number of molecules at each location as a function of distance along the cell. (D) The measured diffusion time as a function of distance along the cell. Spinning disk confocal microscopy of a spindle. Movie of single molecules of tubulin in a spindle. What role does live imaging play in your research and how do you use the CSU system? Much of our research is based on live imaging. Getting quantitative information on the dynamics of subcellular systems is really essential for understanding how they work. Not only that, but it s also incredibly satisfying: the spindle is beautiful, and watching it move and fluctuate is mesmerizing. We routinely use our CSU-X1 to take movies of fluorescently labeled molecules in spindles with a speed and sensitivity that would not be possible with other microscopy systems. Our CSU-X1 is the workhorse imaging system in the lab, which is probably also true for most labs doing live-cell, high-resolution imaging of spindles. We actually also use the CSU-X1 in non-imaging applications. We are very interested in understanding the behavior of soluble molecules in and around the spindle. We are starting to study these by stopping the disk from spinning (which is very straightforward with the CSU-X1) and analyzing the fluorescence fluctuations coming from individual pinholes with a very fast area detector. We hope that this technique, that we are developing, will have wide application for quantitatively measuring the diffusion coefficient, concentration, and interactions of soluble proteins in cells. When did you start using the CSU?? I started using the CSU (a CSU10) when I was a postdoc in Tim Mitchisons lab. I was deeply impressed by the data that can be acquired with this instrument, particularly when it is combined with back illuminated CCDs with on-chip gain. How do you feel about the CSU after actually using it? 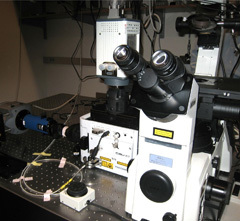 The CSU is an excellent instrument for live-cell imaging. The CSU is a wonderful instrument that enables high-speed, high-resolution imaging, with minimal photobleaching, in living cells. Most of the imaging we do makes use of the CSU. Because of the micromachined lens and pinhole arrays, the CSU is also allowing us to perform multi-point fluorescence fluctuation experiments to study the spatial regulation of soluble molecules. There are a number of ways that the CSU could be made even better: 1) There is currently some cross-talk between pinholes, which means that the observation volume is not as well defined as can be achieved with a laser scanning confocal microscope. Placing the pinholes farther apart would reduce this effect – at the cost of reduced amounts of light. 2) The pinholes are of a fixed diameter that is optimized for high resolution imaging. It would be very interesting if a unit would be developed that could be used with lower magnification and lower numerical aperture objectives. This would allow people to use the CSU for studying larger systems, such as developing organisms. 3) A version of the CSU that could be used with multi-photon excitation would be amazing! We will continue to study the biophysics, cell biology, and evolutionary biology of the spindle using the CSU and other equipment. We are working on novel image analysis techniques, we plan to use the CSU in combination with laser ablation and physical manipulations, and we ll further develop methods for multi-point fluorescence fluctuation spectroscopy with the CSU. The lab is really just getting started. I plan to assemble an interdisciplinary group of physicist, engineers, biophysicists, cell biologists, and evolutionary biologists, and I hope that we will have interesting results to talk about with you very soon. As far as we have been notified, there was only one CSU user, a neuroscience researcher, who used the CSU without rotation to take hundreds of static point images of neurons. When Dan initially asked for our advice when he was a post doc at Tim Mitchisons lab., how to capture images when disk stops rotation, we thought it is not possible for the CSU to capture FCS data, honestly speaking. So, it is our big surprise and also a great pleasure to know Dan has successfully established experimental protocol and data analysis procedures for multi points FCS in which he captures fluctuation in the fluorescence of hundreds of points in the imaging fields through the pinholes in the non-rotating spinning disk. His first publication over his novel approach has been published as below. 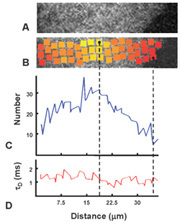 Daniel J. Needleman, Aaron Groen, Ryoma Ohi, Leonid Mirny, Tim Mitchison, Fast Microtubule Dynamics in Meiotic Spindles Measured by Single Molecule Imaging: Evidence that the Spindle Environment does not Stabilize Microtubules. Molecular Biology of the Cell, 2010, 21, 323-333. Daniel Needleman, Cellular Allometry: The Spindle in Development and Inheritance. Current Biology, 2009, 19, R846-R847. Alexander F. Schier and Daniel Needleman, Rise of the Source-Sink Model. Nature, 2009, 2461, 480-481. Uri Raviv, Daniel J, Needleman, Kai Ewert, Cyrus R. Safinya, Hierarchical Bionanotubes Formed by the Self Assembly of Microtubules with Cationic Membranes or Polypeptides. Journal of Applied Crystallography. 2007, 40, s83-s87. Uri Raviv, Toan Nguyen, Rouzbeh Ghafouri, Daniel J, Needleman, Youli Li, Herbert P. Miller, Leslie Wilson, Robijn F. Bruinsma, Cyrus R. Safinya, Microtubule Protofilament Number is Modulated in a Step-Wise Fashion by the Charge Density of an Enveloping Layer. Biophysical Journal. 2007, 92, 278-287. Cyrus R. Safinya, Kai Ewert, Ayesha Ahmad, Heather M. Evans, Uri Raviv, Daniel J. Needleman, Alison J. Lin, Nele L. Slack, Cyril George. Cationic Liposome-DNA Complexes: From Liquid Crystal Science to Gene Delivery Applications. Philosophical Transactions of the Royal Society A, 2006, 364, 2573-2596. Uri Raviv, Daniel J. Needleman, Cyrus R. Safinya, Cationic Membranes Complexed with Oppositely Charged Microtubules: Hierarchical Self-Assembly Leading to Bio-Nanotubes. Journal of Physics: Condensed Matter, 2006, 18, S1271-S1279. Daniel J. Needleman, Jayna B. Jones, Uri Raviv, Miguel A. Ojeda-Lopez, Herbert P. Miller, Youli Li, Leslie Wilson, Cyrus R. Safinya, Supramolecular Assembly of Biological Molecules Purified from Bovine Nerve Cells: from Microtubule Bundles and Necklaces to Neurofilament Networks. Journal of Physics: Condensed Matter, 2005, 17, S3225-S3230. Daniel J. Needleman, Miguel Ojeda-Lopez, Uri Raviv, Kai Ewert, Herbert P. Miller, Leslie Wilson, Cyrus R. Safinya, Radial Compression of Microtubules and the Mechanism of Action of Taxol and Associated Proteins. Biophysical Journal, 2005,89, 3410-3423. Daniel J. Needleman, Miguel Ojeda-Lopez, Uri Raviv, Herbert P. Miller, Leslie Wilson, Cyrus R. Safinya, Higher Order Assembly of Microtubules by Counter-ions: From Hexagonal Bundles to Living Necklaces. Proceedings of the National Academy of Sciences, Track II, November 2004, 101, 16099-16103 Featured as “from the cover” and selected as a Stanford Synchrotron Research Laboratory science highlight(see http://www-ssrl.slac.stanford.edu/research/highlights_archive/index.html).Reprinted in Virtual Journal of Biological Physics, December 1, 2004, 8 (11). Daniel J. Needleman, Miguel Ojeda-Lopez, Uri Raviv, Kai Ewert, Jayna B. Jones, Herbert P. Miller, Leslie Wilson, Cyrus R. Safinya,Microtubule Buckling and Bundling Under Osmotic Stress: A Synchrotron X-ray Diffraction Study Probing Inter-Protofilament Interactions. Physical Review Letters, November 2004, 93, 198104Reprinted in Virtual Journal of Biological Physics, November 15, 2004, 8 (10).